For the vast majority of instruments, simply owning the instrument, sheet music, and having a few maintenance items is all that is needed for a great start to playing. When it comes to the upright double bass, there is an important item that was not mentioned above – a stand for the upright bass. This sort of product is not a music stand, but a stand that actually holds up the bass. This way, the bass is not being propped up by a chair, being leaned against a wall, or being held up by way of another source – which can actually be dangerous. Here is a horrifying story about what can happen if a bass is sitting out and not protected by a stand. Additionally, if a bass stand is owned, the bass does not need to be put away and taken back out all the time – it can simply be placed on the stand until the next time it is used. The majority of bass stands function similarly to the average electric bass guitar stand. They are designed in such a way that the instrument can be safely stored upright rather than being put away and taken out each time the owner would like to practice. The main difference is that the upright bass stand will actually hold up the bass in a very similar way that the musician would when playing. With that said however, the bass should not remain on the stand while being played. It may seem like an attractive idea to not have to support any of the weight at all, but the physical contortions that would have to be made to play the upright bass while it is on the stand would wreak havoc on a player’s posture – something that is very important in learning and maintaining a healthy playing lifestyle, whether the musician plays for fun, professionally, or is just starting out on the instrument. Without any further to do, let’s take a look at the top 5 stands to hold an upright bass! 5. Stagg Like Hercules, but for electric upright bass only! For those looking for the top reviewed stand by consumers, look no further than this double bass stand. The Hercules stand is durable, stable, and very secure when holding the upright bass. 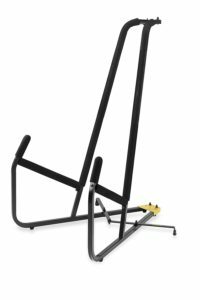 For those looking for the top reviewed stand by consumers, look no further than this double bass stand. 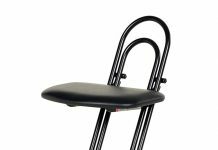 The Hercules stand is durable, stable, and very secure when holding the upright bass. Perfect for use in the home, on site at gigs, virtually wherever you need a bass, this stand can come with you – or it can stay put in one location so that it’s there whenever you are there, you can just put your bass right on it. It alsoThis bass stand comes equipped with foam on all parts of the stand that could possibly come into contact with the bass – protecting the instrument – as the general frame of the stand is made out of metal to make it sturdy enough to hold the instrument. The stand has two locking pins, ensuring that the stand will withstand the weight of the bass without collapsing. Speaking of collapsing, this stand can collapse into a convenient size for storage and travel – making it perfect for bassists who are on the road. 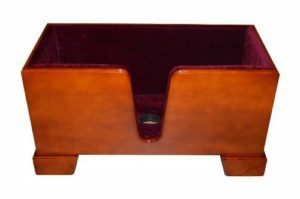 The sleek, professional design and color make it an attractive and appropriate tool for use on stage and in the home. This stand also features an arm on the back to hold the bow – making everything needed to play the upright double bass accessible in the same place! This stand, though a little more expensive than some of its counterparts that are available on amazon boasts almost exclusively 5 star reviews, and is well worth the extra bit of money. For the seasoned player looking for an all-in-one product, they need to look no further than this stand. Not only does it act as a bass stand, but when the bass is removed, it also serves as a stool for the bassist. This would be perfect for a professional or pre-professional bassist, or amateurs and students that don’t mind spending more money for this all-in-one stand/stool. This product stand was actually designed by a bassist – meaning rather than being mass-produced, this product is crafted with care by an expert in the field who appreciates what is needed – and has designed something to fit those needs. The only concern that comes with this stand is that many bassists like a stool appropriate for their height, often one-size does not fit all. This is a very minor and nit-picking detail, as most bassists use mass-produced stools anyways, and if the height is awkward, they seek other means to correct it – even going as far as finding a box the appropriate height for their feet to rest on while sitting on the chair to maintain a healthy posture while playing. 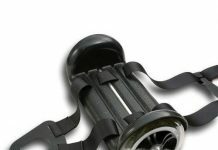 This product is perfect for holding the bass, and as it has been designed by a bass player, it is sure to be safe. 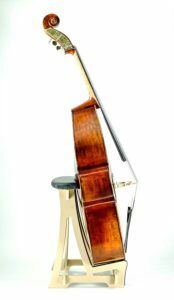 This stand is appropriate not just for upright basses, but for cellos as well. Amazon users sing the praises of its “super high quality, especially for cello use. In terms of the upright bass, this stand is not the appropriate size for a full size upright bass, but it would work very well for younger students that are just starting out, as they will start with a smaller bass more suited to their size. The price tag is nicer than some of the stands that are built to accommodate more full-sized upright basses. For the young beginner bassist who is starting off on an instrument that is a bit smaller, this stand would be a fantastic pick. A neat additional feature of this music stand is a little hook that is on the back of the stand behind where the bass (or cello) is propped up. This hook is intended to hold the bow for the instrument, so that everything you need to pick up and play the instrument is right there for you in one place, much like the feature in the Hercules stand listed above. 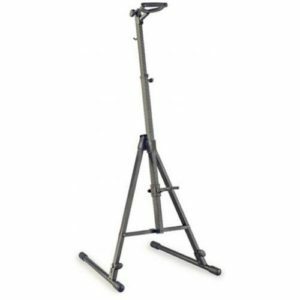 This bass stand has a minimalistic design to the naked eye, and from the picture does not look like it would be the safest stand, but there is much more to this stand than meets the eye. Many bassists and instrumentalists of all kinds are very particular with stands and how much of the stand is coming into contact with the instrument, worrying about the potential to, in this case, scratch the wood of the instrument. It is much safer than it appears, though it is probably not the right case for a noisy home with pets and kids that have potential to run into it and knock it over. Even in that environment, placing it with a wall right behind will help with safety if there is a concern. One additional thing to note is that this stand is designed for ¾ size basses, and can fit smaller basses as well. Stands like this one are often found in schools – particularly middle schools where the basses are smaller than full size to accommodate the size of the average student. The stands also take up very little room and are easy to use – which makes them the perfect addition for the typical already-crammed music room in a school. This stand is on the pricey side, making it come into fourth on this list, but it is still a great option if the description meets the needs. At “Number 5” on this list, we have sort of an “honorable mention” bass stand. 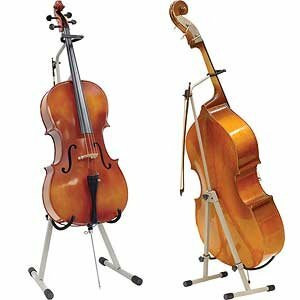 Not to be confused with the acoustic double bass seen in orchestras that the remainder of stands on this list accommodate, nor the electric bass seen in the pop music scene, this stand is designed for electric upright basses. 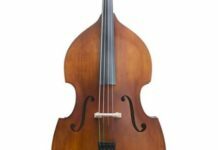 The electric upright bass is sort of a blend of the electric and upright bass – the sound being electrically amplified rather than sound radiation being amplified by the f-holes in the standard acoustic upright bass. Users that have reviewed this product have happily praised it for being “well made”, and for it being the “perfect fit” for the electric double bass. Whether you are a young student just starting to play the upright double bass (or the parent of someone just starting out on the upright bass) or a seasoned player, having a stand to hold the bass while it is not in use is strongly recommended by bass specialists. One of which, the author of Upton Bass, says that every owner of an upright double bass should be “required to own and use a bass stand.” Not only does it protect the bass, but by having the bass out of its case, readily available, and visible all the time, the player is more likely to pick up and play it – whether for a typical practice session, a short little practice session before dinner, for company and friends that see it while visiting, or whenever the player sees it and is inspired to make some music.